Faith is personal. Politics is local. Technology is universal. Women who blog, can make all the difference. Following the Sangkrit’s program, they should become independent as per the internet age. Aggression of Arabism into other countries has been very dangerous to this world in its pursuit of the global hegemony. An unfinished battle against this kind of threat is bleeding within Indian sub-continent. The government of India may finally move for freeing muslim women from three divorces and four marriages. Muslim women waited very long to get this much from Indian state. 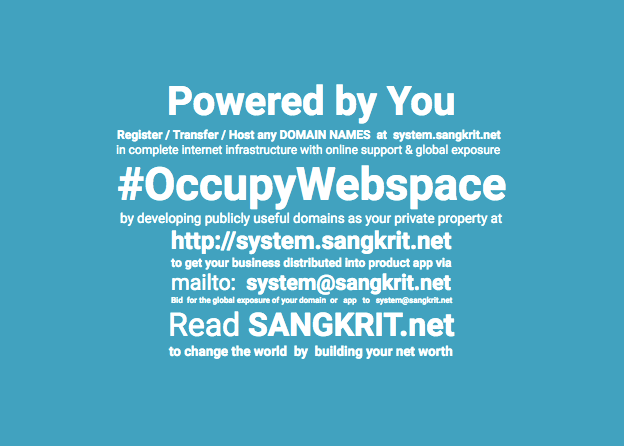 To start own business in internet industry, simply sign up for free SANGKRIT.net account. It is easiest and best for starting own business as an individual initiative because this lets you become a personal outlet of the globally distributed order. You independently work as internet growth engine, making money by helping humankind in using internet infrastructure, online support and global exposure at SANGKRIT.net for changing ways of doing things to startup as business. Selling something balances you best in this world like nothing else would ever do whereas Sangkrit lets you get balanced by selling everything to change the world. Simply by cleaning your place, cooking your meals, programming your world and blogging your knowledge, you may further this into your domestic entrepreneurship for family business. Bringing everybody’s business online is sure to become the biggest business of internet age and procuring online support from system@sangkrit.net lets you easily expand that way so doing that you homeschool your children for successfully inheriting your family business to help everyone around. Thus you make your quantum revolution by upgrading your world into internet age and once you become successful through this course, you voluntarily pay not less than your one-day-income as due fees to sangkrit@icici using UPI or via PayPal to system@sangkrit.net. Performing in a balanced manner comes through the business-wise behavior. Whatever is not useful is just nothing at all. Women mostly act business-wise while doing only useful things. Ultimate emancipation of muslim women would put an end to the pseudo-Arabism that has been the most lethal threat to human integrity across all the countries alike. If muslim women can defeat pseudo-Arabism, the political state should also encourage them everywhere in this regard.